VERSAILLES – Luke Moorman, who works for Reliable Tent Rental out of Celina, assists in putting up one of the many tents for this weekend’s Poultry Days festival in Versailles. 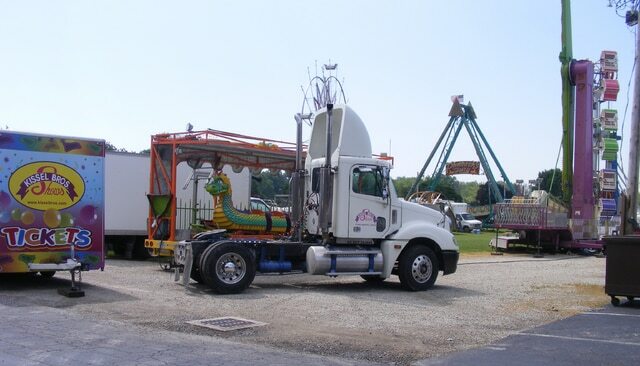 Rides, this year provided for the first time by Kissel Bros.
Shows, which also provides them for the Great Darke County Fair, were set up on Wednesday to get ready for the three-day event, which officially gets underway today. All kind of activities are planned for the entire family. And, there is famous chicken that is served during Poultry Days which attracts a crowd as well as the entertainment at the Social Tent and all other things in between, including pageants, games and other contests.